On show is a lot of work from the last decade, especially since Hockney’s move to the house he had bought his mother in the seaside town of Bridlington in Yorkshire. There are landscapes and portraits. Hockney makes much of his intense and very self-conscious examination of media – watercolor, oils, charcoal, video, digital sketching on an iPhone and iPad, large format digital printing. 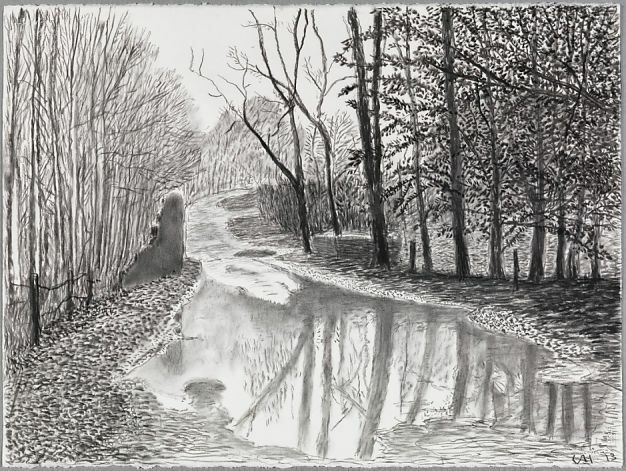 – the monumental scale of many works, the “bigger” treatment, as Hockney terms it – an iPad drawing blown up to 20 feet high, hi-resolution ambient video presented on 36 screens of a walk through the woods across four seasons. We too know Yorkshire. Helen and I recognized the physiognomy of the land, particularly in the charcoal drawings. But not quite. This is not Yorkshire. 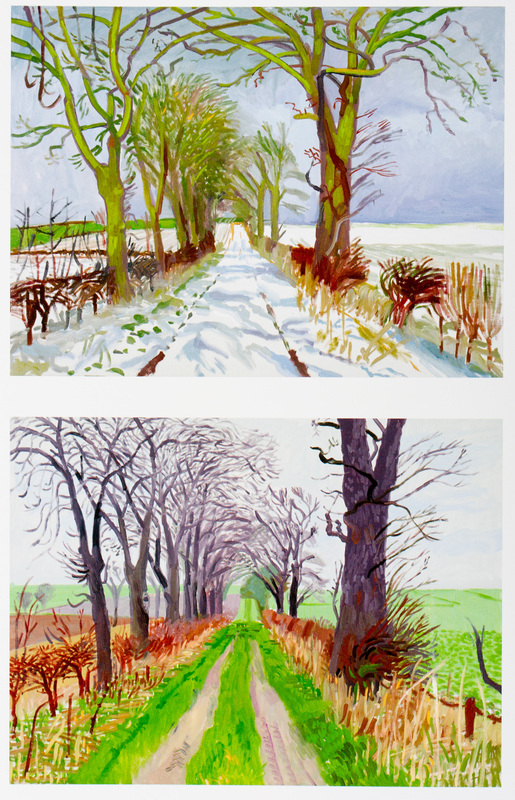 There is a disconcerting distance, displacement, as Yorkshire becomes the California of Hockney’s clean color palette. The ambient detail is quite mannered, and though the videos are very revealing, they imply no setting, no scenarios, no lives for which they are setting, other than Hockney’s gaze. Are we looking at Hockney’s nostalgia? When distracted longing overcomes the benefits of the journey away and the reality revealed more sharply upon return. For his is not a chorography – an intense depiction of the land and its character, its people and their inhabitation. There are no figures in the land(scape) other than the absent presence of Hockney, the maker of marks that we recognize as his and no other’s. And the people in the portraits are Hockney’s circle. They are an international inner circle. There are no locals. The only ordinary people pictured in the show are museum guards. The catalogue records the vandalism directed at one of the subjects of his attention – a tree stump that Hockney called “the totem” – painted with graffiti and then hacked down with a chainsaw. Was this a clue to something? Perhaps I am expecting too much. This is all about Hockney’s art world, and that’s why people have flocked to the show, including us. Why should I expect insights into anything else?